Nathaniel Joseph "Nate" Ruess (born February 26, 1982) is an American singer and songwriter. He is the lead singer of the indie pop band Fun. and previously of The Format. As of 2015, he also performs as a solo musician. Ruess was born on February 26, 1982, in Iowa City, Iowa to Larry Ruess and Bess Zinger. He is the younger of two children, having one sister named Elizabeth. His uncle, John Ruess, was a performer on Broadway and served as an influence for Ruess' musical ventures. In 1986, his family moved to a farm in Glendale, Arizona, due to repeated bouts of pneumonia Ruess faced as a child. Ruess remained in Arizona throughout his childhood and attended Deer Valley High School, graduating in 2000. During his time in school, Ruess played in punk bands and upon graduation chose to pursue music professionally. 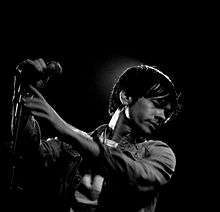 In an interview with American Songwriter Ruess states, "I'm not one to take lessons, so I decided that the only way I was going to learn how to sing, if what they were saying was true, was to go in my car and put on any sort of music from a vocalist that might be really hard to mimic, turn it on as loud as possible and try to hit all those notes". He took a job in a law firm as a way to support himself while he pursued his musical ambitions. In 2002, at the age of 19, he launched the band the Format with his longtime best friend, Sam Means. The Format was his first musical endeavor to gain widespread attention. After forming in 2002, the Format released a five song EP, titled EP, which generated local interest and led to the band being signed to Elektra Records in 2002. They released their first studio album, Interventions + Lullabies, on October 21, 2003, leading to more local mainstream success. The band's fanbase began to grow, and the Format released their second EP, Snails, with Atlantic Records in April 2005. However, while working on their second album, Dog Problems, they were dropped from Atlantic. They eventually created their own label, The Vanity Label, and released the album on July 10, 2006. On February 4, 2008, Ruess announced through the band's blog that the Format would not be making another album. Ruess performing with Fun in March 2010. Immediately after the split of the Format, Ruess contacted Jack Antonoff of Steel Train and Andrew Dost, formerly of Anathallo, to form a new band called Fun. They released their first demo, "Benson Hedges", through Spin's September 20, 2009, article. Four months after releasing their first single, "At Least I'm Not as Sad (As I Used to Be)", through Myspace on April 6, 2009, Fun released their first studio album, entitled Aim and Ignite. The album received generally positive reviews and peaked at 71 on the Billboard 200. The band's first tour happened in 2008 supporting Jack's Mannequin and gained exposure opening for them as well as Paramore in 2010. On August 4, 2010, Fun announced that they had been signed to the Fueled by Ramen label. Their second album, Some Nights, was released on February 21, 2012, and featured production by Jeff Bhasker. The album's first single, "We Are Young", which features guest singer Janelle Monáe, was released September 20, 2011. The song was covered on Glee in December 2011 and featured in a Chevy Sonic commercial during the Super Bowl in February 2012, and reached number one on the Billboard Hot 100 on March 8, 2012. The album has become a success throughout the world, selling nearly three million copies. The album's title song, "Some Nights", reached number 3 on the Billboard Hot 100 and reached number 1 on the Alternative Songs chart. Ruess performing in Tucson, Arizona in March 2012. On February 10, 2013, the band won a Grammy for their song "We Are Young". Upon receiving the Grammy, Ruess commented, "I don't know what I was thinking writing the chorus for this song. If this is in HD, everyone can see our faces and we are not very young. We've been doing this for 12 years and I just got to say we could not do this without the help of all the fans that we've had keeping us afloat for the last 12 years." Fun also won the Grammy for Best New Artist. Alongside Fun, Ruess had been a supporting vocalist for many different songs across genres. In 2012, he was featured on "Only Love" from Anthony Green's second solo album, Beautiful Things, and in 2013 was featured on Pink's album, The Truth About Love, in the song "Just Give Me a Reason". The song began as a simple songwriting session with Pink. She decided the song needed another side to it and subsequently a male part was written. While at first reluctant, with Pink encouraging him, he decided to participate in the duet. The song eventually topped the US Billboard Hot 100, becoming his first number-one single as a solo artist and his second overall. After the success of "Just Give Me a Reason", Ruess was featured on Eminem's eighth studio album The Marshall Mathers LP 2 on the track "Headlights". Many of Ruess' lyrics were borrowed from a previously unreleased track, "Jumping The Shark," written during the Aim and Ignite sessions. On June 18, 2014, Fun debuted a new song on The Tonight Show starring Jimmy Fallon called "Harsh Lights". It would be the last new Fun song performed before Ruess' pursuing his career as a solo artist, however the band has made it clear that they are on hiatus, not splitting up. On February 5, 2015, Fun posted a letter on their official website as a note to their fans on the status of the band. The band wrote that "there was no new Fun album in the works", and instead all three members were pursuing their own projects, including Ruess; who is beginning to release an album, as a solo musician. Fun was founded by the three of us at a time when we were coming out of our own bands. One thing that has always been so special about Fun is that we exist as three individuals in music who come together to do something collaborative. We make Fun records when we are super inspired to do so. Currently Nate is working on his first solo album, Andrew is scoring films, and Jack is on tour and working on Bleachers music. The three of us have always followed inspiration wherever it leads us. Sometimes that inspiration leads to Fun music, sometimes it leads to musical endeavors outside of Fun. We see all of it as part of the ecosystem that makes Fun, fun. In an interview with Rolling Stone, Ruess added, "You get a little selfish about the songs that you write, and it's really hard to do that in a group setting, where there are two other people, and you have to think about everybody else's feelings. I'm writing and singing these songs about myself. When you work with producers versus bandmates, that line becomes a lot less blurry." In addition to his solo album, Ruess was invited to perform on Brian Wilson's album No Pier Pressure. Wilson, who co-founded the Beach Boys, likened Ruess' voice to his deceased brother and former bandmate Carl Wilson. Ruess then contributed as a guest vocals to the frequent collaborator Emile Haynie's 2015 release, We Fall. Ruess' then released his first single from his debut album, titled Nothing Without Love, which was sent to the alternative radio on February 23, 2015. On March 23, 2015, he made the first of multiple appearances, as a guest advisor on the eighth season on The Voice. On April 6, 2015, Ruess announced his debut album would be called Grand Romantic, and it will be released on June 16, 2015. On April 27, 2015, Ruess released the opening track from his debut album Grand Romantic, titled 'AhHa'. In May 2015, he released another song, titled "Great Big Storm", in correlation with the announcement of his solo tour. The song features guest vocals from American singer-songwriter and musician Beck. It was released as part of the countdown to his new solo album. On May 31, 2015, Ruess made his live debut as a solo artist with his newly formed backup band called "The Band Romantic". He performed in Utrecht, Netherlands, at the intimate Tivoli/Vredenburg Cloud Nine location. The set list consisted of the 3 released tracks from "Grand Romantic", several then-unheard tracks from the same album, and songs from Fun such as "Some Nights", "We Are Young", and "Carry On." He also performed his "Just Give Me a Reason". On June 1, 2015, Ruess released an new track from his solo album "Grand Romantic", titled "What This World Is Coming To". "What This World Is Coming To"
"Kill Monsters in the Rain"
↑ Eliscu, Jenny (2012). "Fun". Rolling Stone: 30. ↑ Escudero, Nicki (June 16, 2011). "Former Format Singer Nate Ruess Wants to Have fun. in Arizona". Phoenix New Times. Retrieved January 23, 2012. 1 2 Montgomery, James (February 6, 2015). "Nate Ruess on Going Solo and the Future of fun.". Rolling Stone. Retrieved February 11, 2015. ↑ "On This Day: February 26". The New York Times. 26 February 2013. Retrieved 12 October 2013. ↑ Chris Steinbach (2013-02-12). "Larry Ruess – Brome Hill". Bromehill.com. Retrieved 2015-06-17. ↑ Masley, Ed (February 9, 2013). "How Nate Ruess of Fun. went from Glendale to Grammys", The Arizona Republic. Retrieved May 6, 2013. ↑ Masley, Ed (2013-02-09). "How Nate Ruess of Fun. went from Glendale to Grammys". Azcentral.com. Retrieved 2015-06-17. ↑ Lawler, Joe. "fun. having fun at the top", Des Moines Register, Iowa, 7 April 2012. Retrieved on 5 March 2013. ↑ O'Connor, Christopher. "Adjusting to Format". Phoenix New Times. Retrieved 4 May 2013. ↑ "fun. :Everyday Anthems". fun. :Everyday Anthems. American Songwriter. Retrieved July 2, 2012. ↑ Interview & Show Preview: fun. @ Showbox SoDo Friday, 6/24, Back Beat Seattle, 2011-06-22. Retrieved 2012-04-10. ↑ Archived April 1, 2012, at the Wayback Machine. ↑ Joyce, Colin (2008-08-20). "Members of the Format, Steel Train, Anathallo Unite as Fun". SPIN.com. Retrieved 2015-06-17. ↑ "Fun. Take Song Of The Year Grammy For 'We Are Young'". ↑ "The Truth About Love - Track by Track Commentary". ↑ "Fun., A Message From Nate, Jack & Andrew". Ournameisfun.com. Retrieved 2015-06-17. ↑ Fine, Jason (July 18, 2014). "Brian Wilson's Girl-Powered LP: In the Studio With the Beach Boy". Rolling Stone. Retrieved July 18, 2014. ↑ "All Access Future Releases". Allaccess.com. Retrieved 2015-06-17. ↑ Rivera, Zayda. "'The Voice' Season 8, Knockouts Part 1 Recap: Fun. front man Nate Ruess joins as special team advisor". New York Daily News. New York D. Retrieved 1 April 2015. ↑ "Nate Ruess Announces Debut Solo Album 'Grand Romantic' «". Radio.com. 2015-04-06. Retrieved 2015-06-17. ↑ Vain, Madison (2015-04-27). "Nate Ruess' AhHa debuts: tour will introduce solo album". EW.com. Retrieved 2015-06-17. ↑ "FUN'S NATE RUESS ENLISTS MAD MEN ACTOR FOR "TAKE IT BACK" VIDEO (PREMIERE)". nerdist.com. 2016-01-12. Retrieved 2016-01-19. ↑ "Nate Ruess Details Every Track on 'Grand Romantic' Solo Debut". rollingstone.com. 2015-06-10. Retrieved 2016-01-19. ↑ "Nate Ruess Album & Song Chart History: Billboard Canadian Albums". Billboard. Retrieved December 16, 2015. ↑ Ryan, Gavin (June 20, 2015). "ARIA Albums: Florence + The Machine Return To No 1". Noise11. Retrieved June 20, 2015. ↑ "Nate Ruess Album & Song Chart History: Billboard Hot 100". Billboard. Retrieved April 30, 2015. ↑ "Nate Ruess Album & Song Chart History: Billboard Adult Pop Songs". Billboard. Retrieved December 16, 2015. ↑ "Nate Ruess Album & Song Chart History: Billboard Alternative Songs". Billboard. Retrieved April 30, 2015. ↑ "Nate Ruess Album & Song Chart History: Billboard Hot Rock Songs". Billboard. Retrieved May 4, 2015. ↑ "Nate Ruess Album & Song Chart History: Billboard Canadian Hot 100". Billboard. Retrieved December 16, 2015. ↑ Payne, Chris. "Hear the Latest Solo Track From Fun. 's Nate Ruess". Billboard. Billboard. Retrieved May 4, 2015. ↑ Cameron Matthews (January 11, 2012). "Anthony Green Is in the Collaborative Spirit on 'Only Love' -- Song Premiere". Spinner. Retrieved October 26, 2012. ↑ "RIAA - Gold & Platinum Searchable Database". RIAA. Retrieved 12 October 2013. ↑ "Australian Singles Chart: 01/07/2013". Australian Recording Industry Association. Retrieved 2013-06-29. ↑ "Gold & Platin" (in German). IFPI Austria. Retrieved 2010-09-21. ↑ "Music Canada: Pink (Just Give Me a Reason)". Music Canada. Retrieved 2013-03-01. ↑ "Gold-/Platin-Datenbank (Pink)" (in German). Bundesverband Musikindustrie. Retrieved 2010-03-28. ↑ "NZ Top 40: Singles Chart - 10 June 2013". Recording Industry Association of New Zealand. Retrieved 2013-06-11. ↑ "ARIA Australian Top 50 Singles Chart - 24/03/2014". Australian Recording Industry Association. Archived from the original on March 22, 2014. Retrieved March 22, 2014.